Bring in the Experts. Get it right from the start. Driving IT growth of any kind for an organization requires a thorough assessment of current capabilities and a comprehensive understanding of business requirements. Whether optimizing your existing IT environment or embarking on a transformation, you'll need a well-defined plan, robust the technology and to develop a rollout that won't interrupt operations. Our IT Consultants can help to migrate applications, data, and operating systems, implement cloud solutions, and roll out critical infrastructure. We are a dedicated team with considerable experience of business and technical operations from small to large scale Businesses including Banks, Social Organization, Jewellery, Travel & Tours, Real Estate Companies. 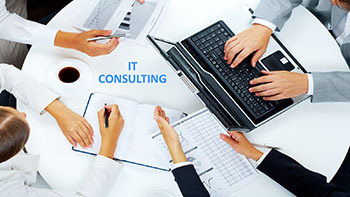 From requirement gathering to IT infastructure strategy, we provide a full range of consultancy services and support to help take the hassles out of your IT projects.